Set (Gerard Butler), the god of the desert, betrays his own family at the coronation of his brother Horus (Nikolaj Coster-Waldau). He kills his own parents, blinds Horus, and assumes control over all of Egypt. 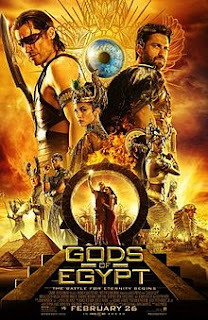 A year later, a thief named Bek (Brenton Thwaites) sets out on a quest to save Horus and save all of Egypt from Set's rule. Gods of Egypt was released about a year ago to some mild controversy over casting Caucasian actors as Egyptian gods and people, and to a wave of fiercely negative reviews by critics around the world. The film's director, Alex Proyas, took a great amount of offence at the critical response, calling the entire profession a pack of 'diseased vultures' and generally carrying on in a deeply embarrassing manner. His primary accusation was that most critics published negative reviews because most critics wanted to ensure they sided with the popular consensus: that critics basically all tow the same party line instead of judging individual films on their merits. Whether that's true or not (spoiler: it isn't) I can at least attest to being a regular holder of minority opinions. When other critics thought John Carter was a terrible film, I said - and continue to maintain - it was great. When most critics hailed La La Land as one of 2016's best films, I found it rather mediocre. Alien 3 remains my favourite Alien film. So with my fiercely independent hat on, with a love for ambition in big-budget effects pictures over how much they actually succeed, I can say this: Gods of Egypt is a terrible film. It's biggest problem is it's story. It is completely ordinary. Plucky thief teams up with a god to exchange enough action set pieces to reach the climax and watch two visual effects pummel each other until one of them wins. It is the sort of plot one forgets as soon as the film's credits are running. There is little suspense, little wit or cleverness in the script. A few lines of dialogue sparkle with humour, but the majority feel very weak and rather tired. It is, essentially, Louis Leterrier's Clash of the Titans: Egypt Edition. That weakness extends to the cast who, due to the extended use of computer-generated sets and locations, almost unanimously suffer from the slightly confused, unrealistic acting that hampered George Lucas' Star Wars prequels. To Proyas' credit, the eye-lines match up a lot better between human actors and visual effects than they did for Lucas. Sadly that's a small silver lining on a much bigger problem. Nikolaj Coster-Waldau comes across as a little lazy and bored as Horus, whereas Gerard Butler falls back quickly on his stock-standard shouting performance that he's done in every second role since 300. Brenton Thwaites is actively annoying as Bek, proving you don't need to be computer-generated sidekick to be a film's Jar-Jar Binks. To his credit Geoffrey Rush gives his all as a theatrical, over-the-top Osiris, but he only appears in a few scenes and cannot help the rest. All that said, the film's production design is wonderful. There is a tremendous imagination to be found in the various gods, settings, and fantasy creatures. Gods bleed gold. The whole of Egypt is actually a flat disc floating in space, with Osiris towing the sun around it behind a lavish space-boat. Set rides into battle on a flying chariot led by enormous beetles. It relies too much on CGI, which gives the whole film a certain unreality that undercuts the drama, but there is plenty of eye candy here. Proyas and his designers should be genuinely commended. Had this film had a script to match its design, with characters deep enough for the actors to properly develop, it really could have been quite something. I am a keen fan of Alex Proyas. I think Dark City is particular is an exceptional film. I really enjoyed The Crow, I Robot and Knowing (its weird ending notwithstanding). I really wanted to like Gods of Egypt, but despite some great visual elements it simply failed to come together. Hopefully next time around Proyas will retain his tremendous design sense and work with a screenplay to match.